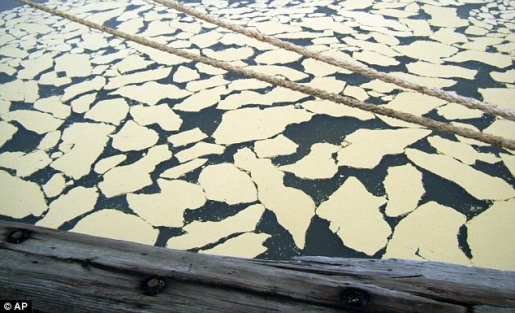 Agriculture suppliers Jacob Sterns and Sons have spilled a staggering 250,000 gallons of beef fat, with 15,000 leaking into the Houston Shipping Channel. The source of the tank leak is currently being investigated; officials did not say what the animal fat was being used for, but I doubt it was for McDonald’s burgers. While inspectors search, unfortunate grunts from the US Coast Guard and Texas General Land Office are scraping 15,000 gallons of beef fat out of the waters of the Houston Shipping Channel in Houston, Texas. The people cleaning up the mess, which has not affected shipping due to its location at the end of the shipping channel, are scraping the fat from the surface of the water using pitchforks. The beef fat is coming up in foot-sized hunks of disgusting cream-colored fat. If you’ve ever made roast, then put it in the fridge, you’ll know what I’m describing; it’s like that kind of roast fat, but in giant chunks. Still, it could be worse; they could be shoveling fat and filth out of the sewer.